The hESC/iPSC Targeting Core provides services to investigators interested in genome editing of any mammalian cell type. We will work with the investigator to provide services to create research models through the use of genome editing technology. 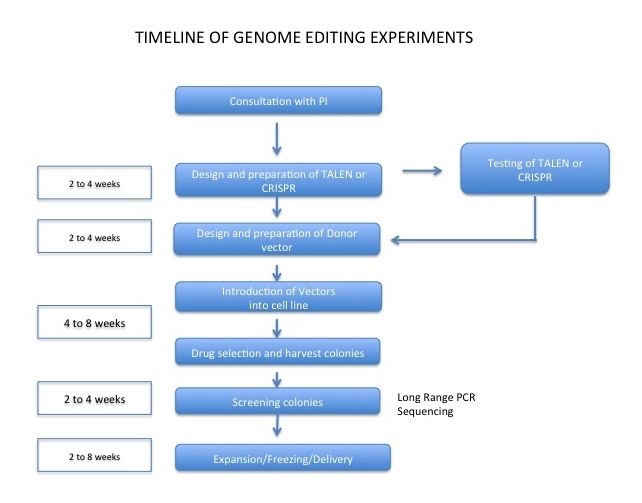 We offer full service TALEN and CRISPR/Cas9 strategies to engineer cell lines for research use. We can provide services in many types for projects including; introduction of mutations or correction of mutations to create isogenic cell lines, CRISPR and lenti-CRISPR based strategies for creating gene KOs, and design and creation of KI reporter constructs for use in genome editing. The core can also create custom targeting vectors to be used in combination with TALEN/CRISPRS to create point mutation KIs, correction of point mutations in disease cell lines, or reporter vectors. In addition to material used for targeting experiments the core can provide the cell culture services. This service can be used to perform cell targeting experiments, selection and genotyping of resistant clones, expansion and freeze of positive cells clones. The core can be utilized as a full service provider, materials design and creation, or as a consultant for your in-laboratory experiments performed by an individual investigators staff. In addition to genome editing, CRISPR/Cas9 technology can be used to alter regulation of a gene coupled with activators or repressors, or for in cell visualization using GFP fused dCas9. Consultation to discuss a potential project is at no charge. Following a consultation, a project outline can be developed and a custom quote made for your particular project. There are many custom applications of these technologies that can be used for many experiment types. Contact us today to discuss how your research projects can benefit from our services. Consultation for experiments done by an individual investigator will be charged at a rate of $39.00 an hour.